Kairo was one of the two extremely abstract first-person puzzle adventure games that excited me at PAX this spring. (Is that an acronym yet? EAFPPAG? No? No.) (The other one was Antichamber, which I'm still looking forward to.) Kairo was just released for Mac/Win, with Linux and iOS promised later this year. I grabbed it on Sunday and jumped in. Kairo is pleasant, but quite short; I finished it in two evening play sessions. Why evening? Because the stark architectonic worlds work better with the lights off. It's not exactly a beautiful game, not like Dear Esther or the highly-rendered graphical adventures of decades past. But the author chose his style and worked the living hell out of it. With little more than rectangles, distance fog, baked shadows, a little focus-blur, and a few concrete textures, Kairo builds an impressive range of architecture -- thematically unified but not repetitive -- and invests it with a startling sense of scale. 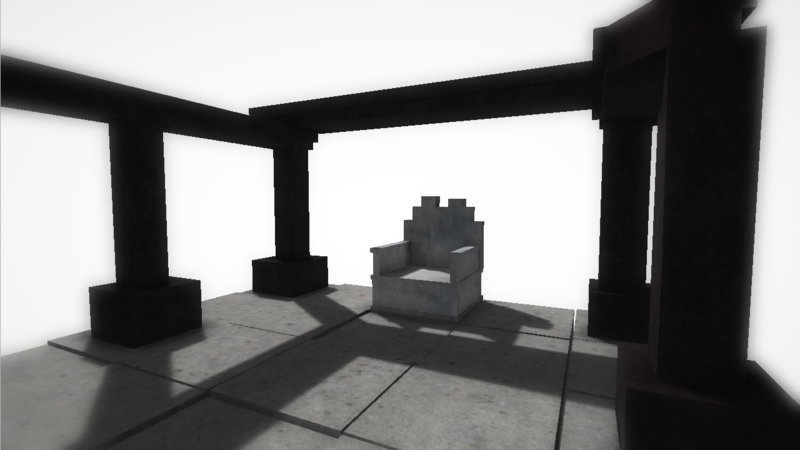 Kairo's puzzles are self-contained; each room is a puzzle in its own right, or else a mere hallway. This means you never have to remember clues, or associate information from one part of the game to another. You will never discover a connection between two machines, or trace an interesting pipe or drive shaft through the game world. But on the other hand, the design sharply limits the kinds of challenges the game can offer. And I think the game could have done more, even within that limit. The puzzles don't make much use of the architecture. You are not challenged to find ways over, around, or through. And also: the architecture doesn't make much use of interactivity. Some areas transform, but mostly in decorative ways, or as rewards, or simply to open new passages or transporters. Impressive, to be sure; just not interactively impressive. Nor does the game do Rhem's trick (really I should credit it all the way back to Riven) of providing puzzle architecture, areas that move and transform in complex ways which must be understood and manipulated. So, as I said, I got through the game in two evenings. I solved three or four puzzles purely by accident. In two of those, I don't understand what I did; I just hit switches (or a switch) until the right thing happened. Of the rest, a couple really made me think; the majority were fairly straightforward. And then there were a couple of secret extras that I didn't work out -- rooms with no obvious purpose, hidden doors that I didn't open. Potentially nifty, but I haven't gone back to solve them. None of this should register as a complaint. Kairo is being sold for a casual-game price -- eight bucks -- midway between a free-to-play twenty-minute Flash escape game, and an old-school full-price weekend-killing story adventure. The challenge is in line with that; I got my money's worth. And I'll never turn down a couple of nights' worth of charismatic megalithons. If I were to level a charge, it would be that the game world never really coheres, beyond the visual level. An adventure can set up its narrative drive through discovered texts and journals (old gag though that is). Or it can build a narrative out of its artistic details, the discovered connections and implications hidden in the visual world. Or this structure can come from the gameplay itself -- the connections you discover between the puzzles and mechanisms that make up the game. By solving, you learn what it's for. Kairo disavows each of these strategies: it chooses minimalist artwork, (nearly) textless presentation, and modular puzzles. They're separate design decisions, but together they more or less rule out the sense of a coherent narrative world. It's not a flaw in the game, but a missed opportunity, I guess. I'll be interested to see how other, upcoming new-style adventure games handle this stuff. 6 years later... Did you ever get around to Antichamber? I found it fascinating but at the same time I can't decide if I liked it or not. It was either brilliant or pretentious nonsense. Fine line I guess. Never played Kairo. It looked too much like NaissancE, which, unlike you, I did finish, but only because it pissed me off so much I was determined not to let it have the last laugh. I did play Antichamber, and I liked it. Perhaps it didn't quite live up to its billing, but it was successful. If you called it "brilliant *and* pretentious*" I wouldn't argue.